$19.303 million on 3165 screens. When I heard Quentin Tarantino planned to make a World War II movie, I felt surprised, as Tarantino previously seemed to prefer to focus on the more recent past. For instance, neither Jackie Brown nor Death Proof took place in the 1970s, but they sure felt like they did. So the idea of a Tarantino effort set firmly in the 1940s definitely intrigued me. The film starts in 1940 and shows infamous Nazi SS “Jew Hunter” Colonel Hans Landa (Christoph Waltz) as he seeks his prey in the French countryside. Landa indeed locates hidden Jews, and he slaughters all of them – except for 18-year-old Shosanna Dreyfus (Melanie Laurent), who manages to flee. Four years later, we find Shosanna living under the assumed name of Emmanuelle Mimieux. She runs a movie house and attracts the romantic attention of German Private Fredrick Zoller (Daniel Bruhl). Shosanna doesn’t realize it, but Zoller is a Nazi legend: perched in a bell tower, he managed to hold off an Allied onslaught all on his own. Because of this, Nazi propaganda minister Joseph Goebbels (Sylvester Groth) commissions a film about Zoller’s exploits. Entitled Nation’s Pride, Goebbels plans to premiere it in Paris. A smitten Zoller uses his influence to move the debut to Shosanna’s theater. Burning for revenge against the Nazis, Shosanna hatches a plan. With many Nazi bigwigs in attendance – including one A. Hitler (Martin Wuttke) – she intends to seal the exits, start a raging fire, and kill the entire Nazi leadership. In the meantime, we meet a band of US soldiers called the “Basterds”. Led by Lt. Aldo Raine (Brad Pitt), this group seeks to cause terror among the Nazi soldiers. They attack on a personal level, take the scalps of their victims, and become the stuff of legend. When the Allied command learns of the Nation’s Pride premiere, they intend to take advantage of it. The Basterds get orders to infiltrate the theater and kill the Nazi leaders – and anyone else they care to slaughter. This leads to much intrigue as the dueling plots unfold. While the 2009 Tarantino lacked the same “force of nature” brashness of the 1994 Tarantino, he boasted a greater level of maturity and he seemed to suffer from less need to impress the audience with his cleverness. 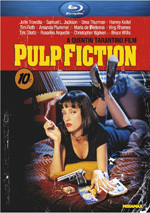 Don’t get me wrong: I love Pulp Fiction and will probably always view it as Tarantino’s finest work. However, like most of his flicks, it comes with a certain preening “hipper than thou quotient”. Granted, Fiction really was awfully hip, so Tarantino got away with his smugness, and the director’s sheer talent usually carried the day in his other works. I don’t think Tarantino has made a bad movie to date, and I enjoyed all six of the flicks he created prior to Basterds. That said, we had seen moderately diminished returns; while good, none of Tarantino’s post-1994 films merited favorable comparison with Fiction. And Basterds isn’t quite on that same level either, but I think it’s close. Or I think that today – time may change my mind. Right now, I find myself deeply impressed by what Tarantino did with Basterds. Some of that comes from the fact that Basterds rarely offered what I expected to find. Based on trailers and my general impressions of Tarantino, I anticipated something wild, violent and semi-campy – a 70s exploitation flick vibe brought to WWII. And that’s occasionally what Basterds delivers – but only occasionally, and only in a negligible manner. In Basterds, Tarantino walks a fine line. 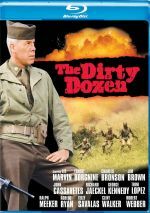 Sure, he shows hints of his inspirations – you’ll see signs of Sergio Leone as well as WWII-based efforts like The Great Escape or The Dirty Dozen - but he doesn’t heavily indulge in these. The director also manages to avoid stereotypical Tarantino tendencies. The movie lacks his signature flamboyant dialogue, and it comes without much of the self-conscious showiness that usually appears in his flicks. Again, aspects of these traits remain, but they’re not overwhelming; Tarantino seems content to evoke them rather than force them on us. Which helps make Basterds a more fulfilling, complete film than the violent goof I expected. Tarantino seems truly self-assured here, especially during the flick’s opening scene. Basterds didn’t boast a huge budget, but it wasn’t inexpensive, either. Given the way the studio promoted it, I expected it to launch with a big action scene and lots of Pitt. Instead, the first 21 minutes focuses on Landa’s mostly low-key search for the hidden Jewish family. Viewer befuddlement must’ve run rampant, as this scene seemed to come from an entirely different movie than the one anyone would’ve anticipated. And it’s absolutely brilliant. The subsequent 130 minutes or so could’ve been awful, but Basterds would deserve attention for the taut, masterful telling of the search. This all evolves over a dining room conversation between Landa and the homeowner. It’s shockingly civilized and completely fascinating. After that, Tarantino does indulge our desire to finally see the titular Basterds, but even then, he rarely gives in to expectations. As I mentioned, this isn’t the uber-violent “B”-movie it seemed destined to be. Heck, Pitt’s Raine isn’t even the main character. I don’t think we really have a lead role here, but I’d take Shosanna or Landa over Raine. It’s a true ensemble piece, which you wouldn’t guess from the movie’s trailers; those focus almost entirely on Pitt and the flick’s action. If the ad campaign got butts in the seats, then I guess it’s all forgiven in the end. Basterds did fairly well at the box office, and it deserved that success. I have no idea how many of those patrons liked what they saw, as the film promised by the trailers wasn’t the one that ended up screen. I do know that I really like it. Basterds manages to have its camp and eat it too. There are just enough signature Tarantino moments to satisfy, but not so many that the movie becomes another glib hipster-fest. Even when Tarantino takes anachronistic risks, it works. For instance, when Shosanna prepares herself to execute her mission, the film uses David Bowie’s “Cat People” as the soundtrack. On the face of it, this seems like a bizarre choice, but it really soars; the tune’s moody intensity gives the sequence zing. Like the opening chapter, it’s a dazzling sequence, though for nearly opposite reasons; the former impresses due to its simplicity, while the latter succeeds because of its saucy implausibility. Pitt and the Basterds may get all the attention, but Shosanna’s story becomes the film’s heart. In truth, the flick could’ve only told her tale and it still would’ve been good. Actually, the same goes for the Basterds; this is really two films combined into one, and either would succeed if separated. But the combination turns the experience into something special, and the treatment of Shosanna’s plot becomes especially satisfying. She’s not some poor tragic figure who suffers from overt PTSD or anything. Shosanna is a warrior who feels the pain of her loss but is damn determined to get her revenge. She’s a Jewish Ripley! Usually when a movie doesn’t deliver what I anticipate, I view that as a bad thing. In the case of Inglourious Basterds, it became a positive. The film surpasses expectations and becomes something genuinely special. 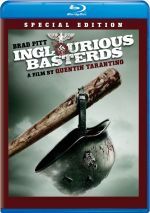 Inglourious Basterds appears in an aspect ratio of approximately 2.40:1 on this Blu-ray Disc. Although not flawless, this was a generally strong presentation. Overall sharpness looked good. Wider shots could be a smidgen soft, but not to a significant degree. Still, the movie demonstrated positive clarity and accuracy the vast majority of the time. Neither jagged edges nor moiré effects became an issue, and source flaws remained absent. Colors were subdued due to the film’s design. That made sense: most period flicks go with restrained tones, and this one’s exploration of war made it an unusual choice for big, bold hues. The film stayed with an earthy palette that suited it. Blacks were dark and deep, while shadows looked clean and clear. The mild softness made this one a “B+”, but it usually looked strong. Given the film’s war setting, I expected a slambang DTS-HD MA 5.1 soundtrack. To my moderate surprise, though, Basterds went with a mix that often lacked much punch. I didn’t see that as a real problem, though; the track did what it needed to do when it needed to do it. This meant the soundscape remained quite restrained for long stretches. In fact, at times the film came across as nearly monaural. Music showed good stereo presence – depending on the source, that is, as some of the cues focused on the center. Effects tended to be subdued much of the time; the vast majority of the film kept things quiet, and even general ambience was minimal. The track came to life during the occasional battle scenes, however. Those used the five channels well and created a full sense of the settings. Indeed, the fact that so much of the movie remained quiet accentuated the impact of the louder scenes. They didn’t pop up often, but they worked well. Audio quality was positive. Music depended on the source materials. The film featured a lot of older recordings, so those could be scratchy at times. Nonetheless, the music was generally fine given the limitations of the elements chosen. Speech sounded concise and natural; no edginess or other problems materialized. As I noted, effects didn’t often have much to do, but they were always accurate, and they boasted good impact when necessary. The general lack of ambition made this a “B” soundtrack, but I was fine with it; I don’t think it needed to be super-active to succeed. Visuals showed a bigger step up, though. The Blu-ray provided a tighter image, and it lost some edge haloes from the DVD. This became a significantly more attractive visual presentation. The Blu-ray replicates all of the DVD’s extras – and adds one. The Killin’ Nazis Trivia Challenge sends you through six rounds of 10 questions each, all of which relate to the movie, those who created it or WWII. The items tend to be surprisingly hard, so “Killin’” offers a tougher time than expected. The questions do repeat after awhile, so the game doesn’t have a ton of repeat value, but it’s still a better than average trivia contest. We find three Extended and Alternate Scenes. These include “Lunch With Goebbels (Extended)” (7:16), “La Louisiane Card Game (Extended)” (2:13) and “Nation’s Pride Begins (Alternate)” (2:09). “Lunch” may be extended, but it doesn’t add anything substantial; the clip is interesting mostly because of consists of one long, uninterrupted take. Similar feelings greet “Game”, which really goes on too long. The tidbits of the game already in the film are fun, but they’re more than enough to convey what we need. “Begins” is the only one that’s really different. In the final film, we launch right into Pride, but this clip gives it much more of a buildup. I kind of like it. The set also features Nation’s Pride: Full Feature. It runs six minutes, 11 seconds and shows all the parts of the bogus movie presented in Basterds. Of course, if the Nazis had actually made Pride, it would’ve been longer than six minutes, so it’s a little misleading to call this the “full feature”. I also think it doesn’t really play like a Nazi propaganda film; it just doesn’t reflect the style especially well. Still, it’s fun to see, especially since we get to check out parts of Pride that we can’t observe in the final cut. We move to a Roundtable Discussion with Quentin Tarantino, Brad Pitt and Elvis Mitchell. It lasts 30 minutes, 44 seconds and looks at Tarantino’s work on the set, characters and performances, screening the film in Germany, research and historical liberties, storytelling and the movie’s structure. Pitt and Tarantino don’t give us a complete overview of the film, but they offer a lot of interesting notes. They’re certainly chatty and gregarious, and they manage to deliver a good array of information here. For more about the film within the film, we go to The Making of Nation’s Pride. In this four-minute, one-second clip, we hear from director Alois von Eichberg, Reich Minister of Public Enlightenment and Propaganda Joseph Goebbels, actress Francesca Mondino, and war hero/actor Fredrick Zoller. Yes, “Making” is a fake documentary, as it features actors in character to discuss the non-existent Pride. (Von Eichberg is the only character who doesn’t appear in Basterds; Eli Roth – who directed the actual Pride clips – plays him.). It’s silly but fun. Next comes the seven-minute, 39-second The Original Inglourious Basterds. It features Roth and actors Bo Svenson and Enzo Castellari. We get notes about shdkjsa’s Inglourious Bastards and how its star (Svenson) and director (Castellari) appeared in Basterds. We also see a few minutes of the prior flick. I didn’t know there was an earlier film with almost the same name, though they don’t offer the same story; Basterds clearly isn’t a remake. Nonetheless, I like this opportunity to check out a bit of Tarantino’s inspiration. To hear more from one of the film’s actors, we go to A Conversation with Rod Taylor. During this six-minute, 44-second clip, the veteran performer chats about how he came onto the film, his performance as Winston Chuchill and working with Tarantino. The clip’s too short to have much substance, but it proves enjoyable. More comments from the actor show up in Rod Taylor on Victoria Bitter. This one fills three minutes, 20 seconds with Taylor’s story about Tarantino and how the director provided him with an exotic beer. I’m not sure why this didn’t appear in “Conversation”, but it’s entertaining. Quentin Tarantino’s Camera Angel goes for two minutes, 42 seconds. We see a reel of clapboard clicks and hear the amusing terms used for abbreviations. For instance, take 48N becomes “48 Nazis”. This is a strange and amusing compilation. Something unusual arrives via Hi Sallys. In the two-minute, 10-second reel, we see filmed greetings to editor Sally Menke; cast and crew throw these out at various times. Like “Angel”, we find a cute collection. Glimpses of movie ads show up in the final two components. We get a Film Poster Gallery Tour with Elvis Mitchell. It runs 11 minutes as Mitchell discusses the fake movie ads created for Basterds as well as real posters we see. This means close-ups of promos for Nation’s Pride and whatnot. He refers to other films/ads and places the Basterds images in perspective. Mitchell makes this a quality program. After this we find a Poster Gallery. This shows 37 stills of posters from around the world. Most are quite similar and just vary in terms of language used, but they’re still interesting to examine. Finally, the disc provides some trailers. This gives us four Basterds ads: the US teaser and trailer as well as international and Japanese trailers. It took him 15 years, but Quentin Tarantino finally made a movie that might just live up to the expectations he set with Pulp Fiction. I hesitate to put Inglourious Basterds on the same level, but it’s a damned fine flick that succeeds on many levels. The Blu-ray delivers pretty positive picture and audio along with a generally average set of supplements. 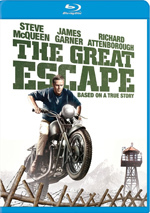 I recommend this terrific movie, and the Blu-ray represents it well.